Designed with the historic RIEDEL lettering in the centre of the carafe, the decanter is created in homage to sixth-generation Josef Riedel Senior, also known as the ‘Glass King of the Jizera Mountains’. Personalise with your Company logo. Minimum 50 pcs. Please enquire for a separate quote. 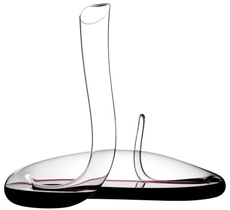 Superleggero Decanter is a tall, slender and elegant decanter that will look great alongside any Riedel glass. 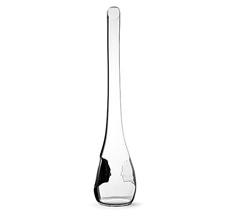 Mouth blown from lead crystal, it has a recess in the base for easy, comfortable handling and a special seal on the neck engraved with the Riedel logo. 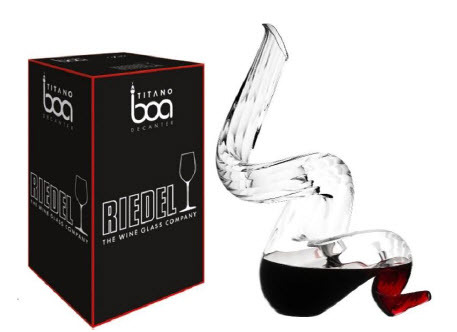 The Titano Boa is optical blown and advances “double-decanting” technology to accelerate the aeration of wine by the creation of a vacuum within the vessel. Limited to 500 pieces worldwide and only 12 pieces in Singapore. 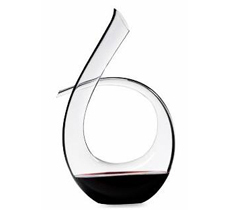 2013 is the Chinese Year of the Snake, so to celebrate, Riedel has produced another decanter to join its serpentine series. Consisting entirely of tight coils, the Boa double-decants, ‘opening up’ wine in mere seconds. 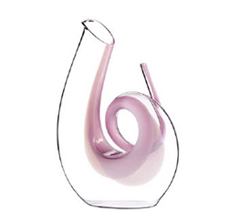 A clear, curved decanter accented by a soft pink stripe, playfully evoking a pig’s coiled tail, that helps to “charge” and aerate wine. 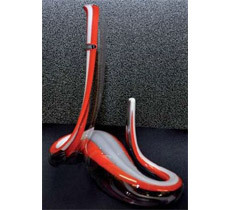 The dragon decanter is the continuation of free blown Riedel decanters made to open up young wines. These wines need time and lots of air to breath to show off their full potential. 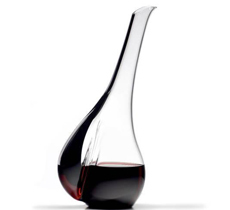 The TWENTY TWELVE decanter will offer these features in conjunction with stunning aesthetic. 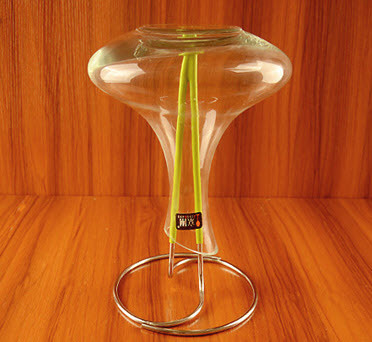 Extreme glass making skills are required to mould this special decanter and Riedel glass makers are able to achieve the desired goals. 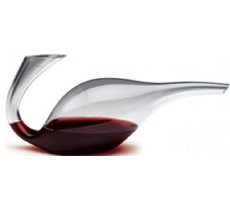 The alluring Mamba, designed by Maximilian J. Riedel, is redolent of a sleek mamba snake. 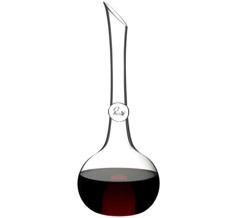 As the wine flows through every bend, it is double-decanted, “opening up” upon entering the decanter, achieving what would take hours of decanting in a typical bowl-shaped carafe. 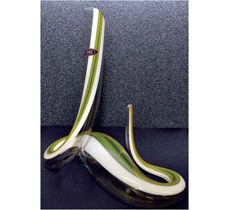 The alluring Mamba, the latest design by Maximilian J. Riedel, is redolent of a sleek mamba snake. 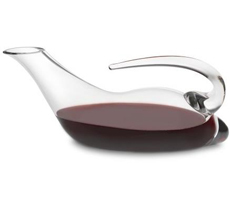 As the wine flows through every bend it is double-decanted, “opening up” upon entering the decanter, achieving what would take hours of decanting in a typical bowl-shaped carafe. 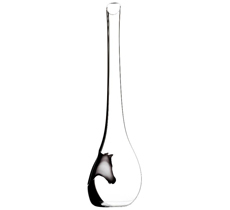 Designed by 11th-generation Riedel Crystal president and CEO, Maximilian Riedel, the 23 inch mouth-blown crystal decanter was inspired by the Chinese Year of the Horse and the famous Royal Lipizzans – a rare and aristocratic breed originating from Austria. 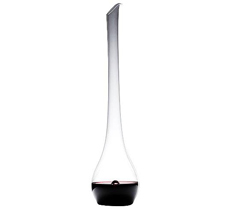 This elegant new Sommeliers Black Tie Face To Face wine decanter from Riedel is designed to pair with the Riedel Sommeliers Black Tie stemware, but can easily stand alone as your most favored decanter or modern art piece. 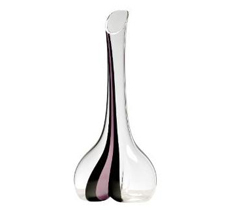 Hand-made and mouth-blown, this lead crystal decanter features graceful, elegant lines, and, inverted into each side of the decanter are the forms of two profiles. A beautiful black accent line is blown seamlessly into the body of the vessel, and runs down one side and through the profile of one face. 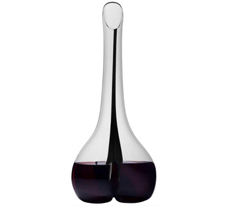 The EVE decanter, designed by Maximilian Riedel in 2008, is a tribute to the family’s matriarch, Eva Riedel. 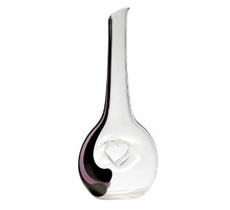 Each EVE decanter is free blown by a master glass blower in Austria and is a unique and functional work of art. There is no more elegant bird than the Swan, so Riedel thought it only fitting that their new Swan decanter should embody the same natural grace. 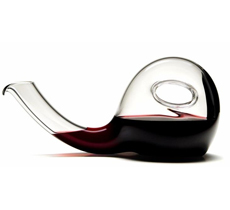 The body of the decanter mimics the gentle curvature of the form of a Swan, forming “J” shape with an exaggeratedly elongated straight neck that narrows to the elliptical lip. Handmade by only our top master glassblowers in the finest lead crystal. Famed for their vibrant pink color and long, stick-like legs, the Flamingo is an immediately recognized bird. 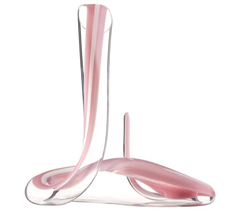 Equally distinctive is Riedel’s new Flamingo decanter – though it’s not at all pink. The Black Tie Decanter is ‘free blown’, meaning the glass blower forms it by hand without the aid of a mold. A rod of black crystal (colored by manganese oxide) is introduced while the glass is molten. 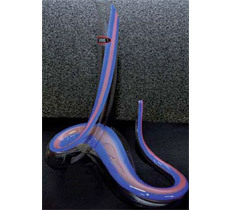 The length of the hollow glass piece is determined by the arm span of the glass blower. The Amadeo Black Tie Decanter shares the same graceful lyre form as the other decanters in the line, but adds a distinctive difference. Its flawless clear crystal body is articulated with a single slender black tuxedo stripe that lovingly follows the contours of its stylized U-shaped silhouette. This Riedel Amadeo decanter was specially designed and created to commemorate the Riedel Family’s 250th Anniversary, and is truly a gorgeous work of art. 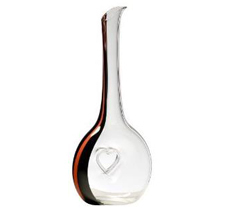 Hand-made and mouth-blown by very skilled artisans, this piece is produced only by top-level master glass blowers in Europe, making each decanter unique; no two Amadeo decanters are exactly alike. Strikingly elegant shape for decanting red wines. Made of 24 percent lead crystal. Seemingly defying gravity, Touch rests confidently on an asymmetrically bulb-shaped base and features a ridge that tapers into an elegantly angled neck. This ridge, adorned with a chic ribbon of black crystal, effectively acts as an integrated handle, guaranteeing a comfortable grip in the hand. 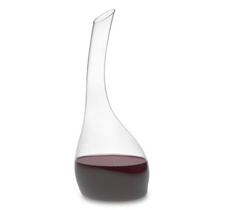 With its soft curves, Smile’s sultry form makes this decanter a superb addition to any collection. 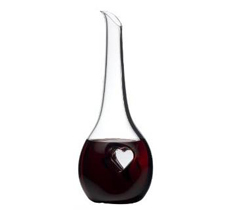 The decanters inverted heart-shaped base makes it effortless to hold in the palm of the hand and easy to pour. Starting from the narrow opening at the top, Black tie’s signature tuxedo line descends dramatically to the bottom. Handmade and mouth blown. 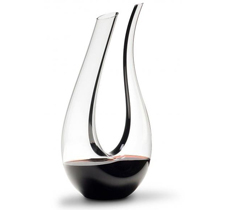 The Bliss decanter stands 14-3/8 inches tall and is one of Riedel’s most romantic pieces yet, each adorned with a sophisticated ribbon black crystal making this a marvelous addition to the black tie collection. 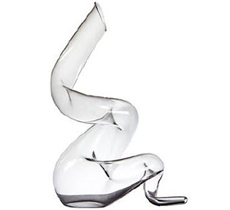 This decanter is mouth blown and formed by hand without the use of molds, making each a unique work of art. 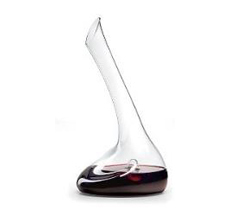 A stunning decanter from Riedel’s sommelier range. 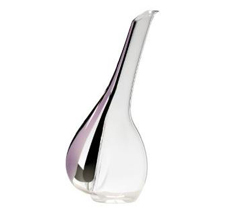 Made from beautiful lead crystal, this is not just a decanter, but a work of art. 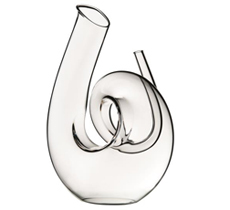 Riedel’s handmade lead crystal Escargot decanter’s design produces double aeration. It boasts a unique shape and challenging design and because they are handmade, since no two are alike, each one provides a unique piece of art. This decanter has a 49-3/8-ounce capacity and arrives in a beautiful gift box that is perfect for storing when not in use. 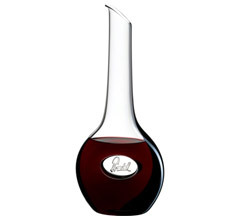 The Riedel handmade lead-crystal Flirt decanter oxygenates and enhances the flavors and aromas of red wines. 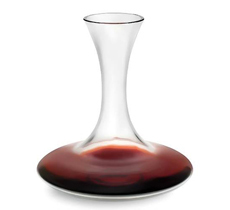 It has a thumb-sized print at the base of the decanter for ergonomic pouring. 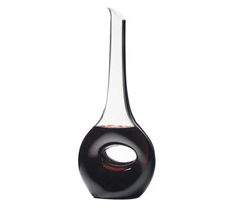 This sculptural decanter has a capacity of 62-ounces and is a must-have to complete any wine connoisseur’s collection. 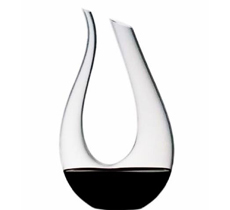 The decanter arrives in a beautiful gift box suitable for storing while not in use. 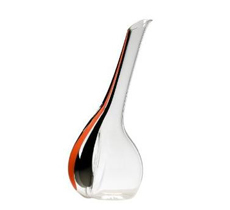 Gorgeous, elongated decanter; 17-3/4 inches high, 52-7/8 ounces. The Ravenscroft Ultra Magnum is our largest classic captain’s shape carafe; at 87 oz, it easily holds a magnum size 150ml bottle, or 3 regular 750ml bottles. It has a low neck, with a beveled opening. 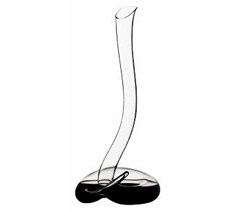 Once you’ve cleaned your wine decanter, simply place onto the stand and your decanter will drip dry! 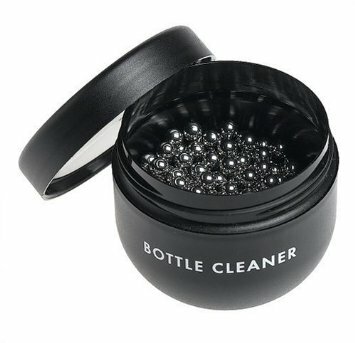 Ideal for draining tall wine decanters.